Seal Beach Pier on May 5th, 2016 with representations of the oil and shipping industries in the background. I took this photo from the Seal Beach pier in Southern California this morning. It’s cloudier than usual, however, what you can see is an oil field worker heading out to the crew boat to start his shift on one of the many platforms offshore California. 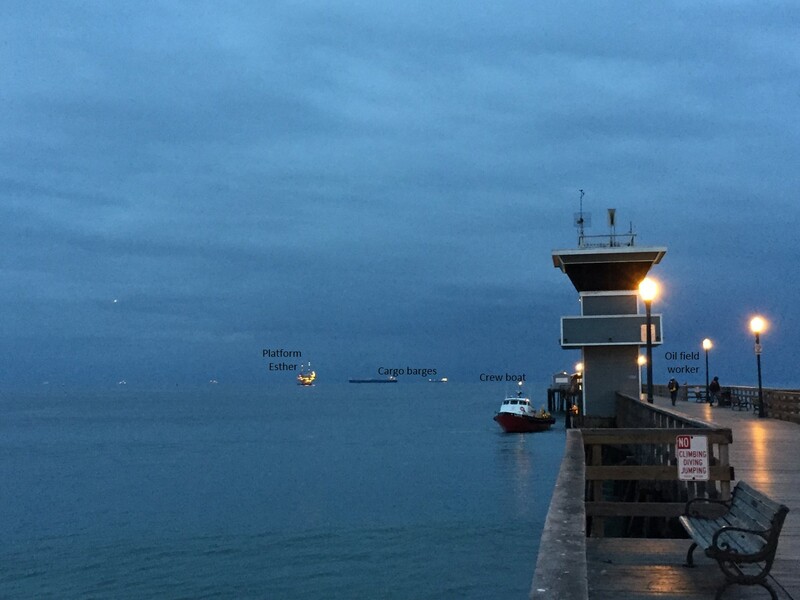 What you don’t know is that there were usually three or four crew vessels and about 50-60 workers on this pier at this time over a year ago catering to the different platforms. It is a reminder of the effect the low commodity price has had on the industry and, sadly, it is no different in California. The problem is that many don’t see this time in the industry as an opportunity to invest in oil. You’ll see me repeat this statement over and over again “The time to invest in oil is now!” It’s not just me stating that, this message is all across the industry by smaller operators in places like Texas, Oklahoma, Kentucky,Kansas, Tennessee and Pennsylvania. It may appear to be hidden by news of layoffs and bankruptcies for many. However, there are tons of opportunities out there to invest. I’m not talking about buying stock in oil field related companies or maximizing your employee stock share program. That could be beneficial for the conservative folks or complacent types. It’s not where higher risk / higher reward is, though. I’m talking about purchasing oil wells, buying leases, participating in turnkey drilling and production projects, buying overriding royalty interests and partnering in equity projects. These are only some of the examples. OIL AND GAS EXPLORATION IS CONSIDERED HIGH RISK AND CAN RESULT IN 100% LOSS OF CAPITAL. INVESTING IN THIS SPACE IS FOR OIL AND GAS OPERATORS AND INDUSTRY PLAYERS THAT UNDERSTAND THE INHERENT RISKS AND REWARDS OF OIL AND GAS EXPLORATION. Well, that doesn’t read very attractively for those that don’t understand the risk vs. reward models in this industry. However, there are tax advantages and potentially high rewards which make oil and gas investment attractive. You just have to know how to mitigate your risk through proper geological evaluations and economic analysis. These opportunities are mainly economic in the onshore US so keep that in mind. I’m not advocating for any offshore or international opportunities at this time. Please don’t let the photo above misguide you. I recently read an article that was written earlier this year by John F. Templin II, Ph.D. and couldn’t agree more. Thank you, John, for writing it. See link below.